In 5 quart Dutch oven or stock pot, combine 8 cups of water with black food color. 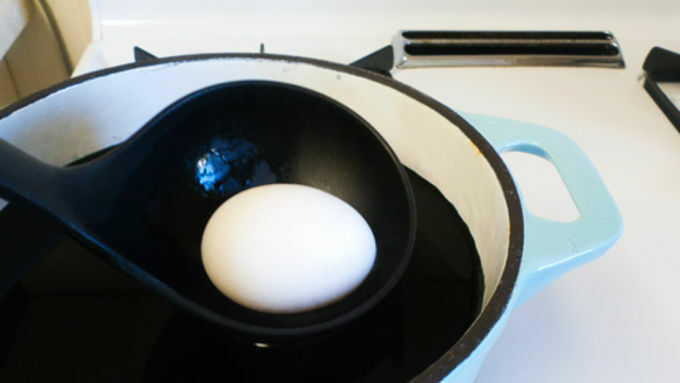 Put eggs in a single layer, cover and bring to boil. Remove from heat and let stand for 15 minutes. 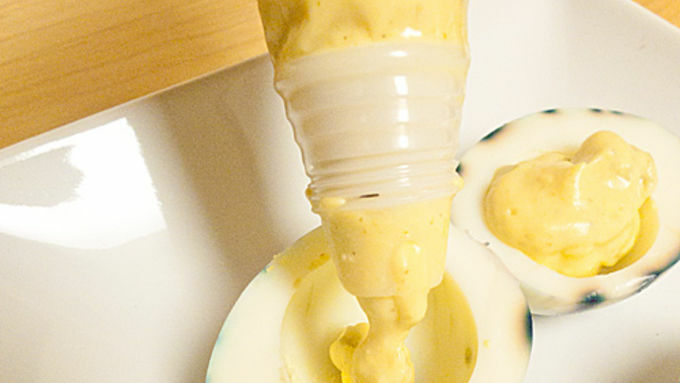 Using a slotted spoon, place eggs on paper towels. Place colored water in fridge to cool. 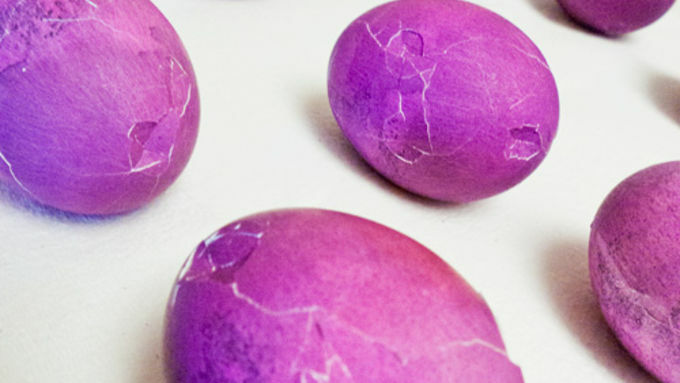 Use the end of a wooden spoon to tap each egg in several places to slightly crack shell. The more places you crack, the more webbing the egg will have. 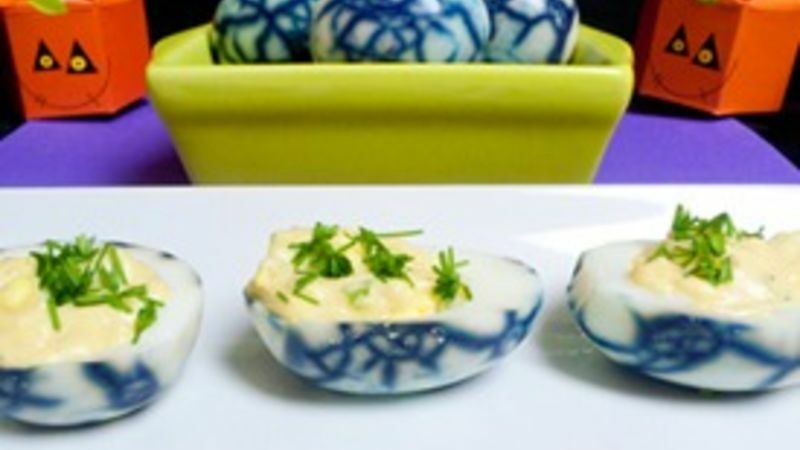 Place eggs back into cooled colored water and let sit for 2 to 3 hours. When done, peel eggs and cut lengthwise. Using a teaspoon, scoop out the egg yolks and set whites aside. Mash yolks with the remaining ingredients. Fill each egg white with yolk mixture. Garnish with chives. Serve, or cover and refrigerate. If you really want to spook-ify your Halloween party table, Spiderweb Deviled Eggs will do the trick for your treats. When I spotted these deviled eggs in the Pillsbury™ Halloween Best Recipes magazine, my spider senses told me I just had to try them out. The chipotle mayo flavored filling sounded delicious, and they looked awesome in a “kinda-creepy-but-will-eat-a-dozen-by-myself” kind of way. Now while it’s standard to go all out on your Halloween costume, these didn’t take much to make. The one part I must stress is…wear gloves. Unless your costume is Edward Spiderhands, you want to protect your digits from the black food dye. When it comes time to crack the egg shells use the end of a wooden spoon to tap all sides of each egg. (Don’t forget the ends!) Tap just hard enough to crack the shell and put some distance between your cracking points. You don’t want the shell to fall off of the egg. Also note that the more cracks you have, the more webby your deviled eggs will look. 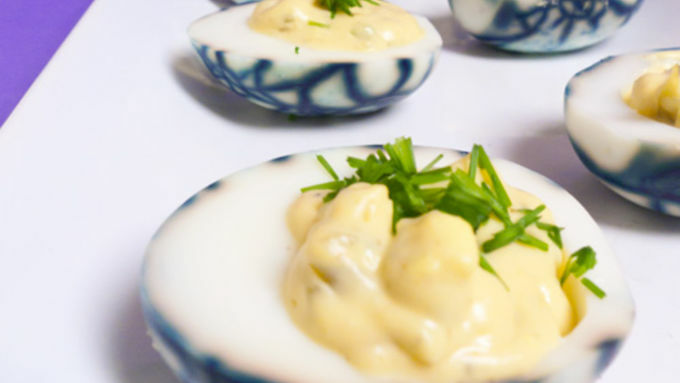 Garnish with chopped chives, and you have yourself a ghoulishly good party app! (Or if you’re me – a meal for a party of one.) You can also set aside a few uncut eggs to use as a centerpiece. They look extra creepy with the lights turned down low. Have a very happy Halloween!